I will confess that I am firmly in the camp of dog pet owners. I’ve had a few dogs over the years and I love their unbridled enthusiasm and joy at exploring new things. They’re always happy to greet you and can’t wait to see what’s new and exciting. Cats on the other hand are aloof, demanding, moody creatures. Nothing appears to be good enough for them; they turn up their nose at things that don’t suit them. They shun exercise and playful activities. Try playing Fetch or Tug-of-War with your cat – NADA. Yet cat owners will go to any length to please their snobby felines. No cat bed is too soft, no food too sumptuous, no cuddly toy too exotic, no expense is too great. Bah, give me a dog, a bag of dog chow, and a ball – and I have lasting and honest pet enjoyment. Before cat owners send out the Vigilante Squad to silence me, let’s tie this in with CES – the Consumer Electronics Show we recently attended in Las Vegas. Among the thousands of products we saw, a fair number of Smart devices were targeted at pet – specifically cat – owners. Certainly this is on the fringe of must-have products, but I want to use the Smart Pet Home as an object lesson to highlight a fundamental problem. Smart products are Internet-enabled devices designed to enhance and automate common functions. A simple example is the Smart light bulb. Smart light bulbs connect via WiFi to the Internet and can be controlled from an APP on your phone. You can: change the light level or colour from the APP, or program the lights to change on a schedule, or activate if someone enters the room, or turn on if it’s cloudy, or turn off if it’s sunny. Of course, Smart light bulbs can also be linked to Google‘s Home or Amazon‘s Alexa controllers; say “turn the lights down at 7 PM” or “wake me up with soft lighting at 6 AM”, and the lights know what to do. CES had thousands of Smart-controllable devices; one for every conceivable home or business function. I’ll entice you with more examples in future articles, but for now let’s stick with the Smart Pet Home. Exercise Treadmill: a one-meter diameter rotating cylinder that kitty walks on. It tracks kitty’s daily exercise; cat-steps if you will. 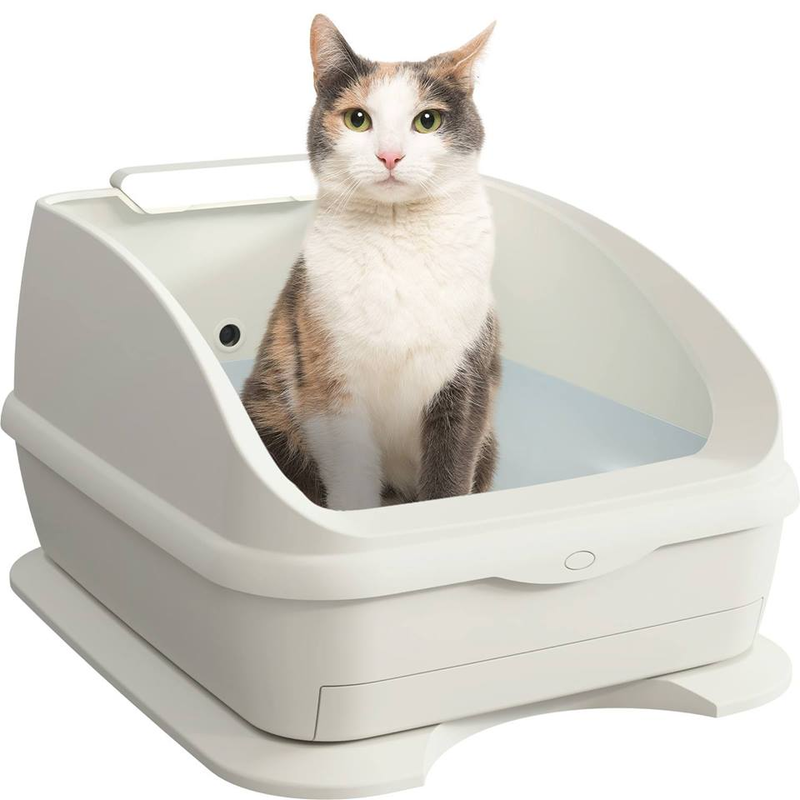 Litter Box: an enclosed litter box with automatic door. Feeder: a cat-food dish with controllable dispenser, to allow kitty to eat different foods at predetermined times. It can even add cat food to your grocery list. Outside Door-Port: an automated pet door that opens when kitty comes near it; the door allows kitty in or out of the house. It’s Smart in that it only opens for kitty. Mouse Toy: a motorized rodent-shaped device with a long tail that scampers around the room, as kitty chases it. It adjusts its’ speed and direction, based on kitty’s movements. All of these had phone APPs or interfaced with Home or Alexa. Thus, you can tell the treadmill to run for 20 minutes at 2:00 PM, or anytime kitty gets on it – or tell the feeder to dispense a large serving of Kittles at 9:00 AM, and a small portion of Iams at 5:00 PM – or tell the door port to allow kitty outside, between the hours of 8:00 AM and 7:00 PM – or the mouse toy to run around the living room at 3:00 PM. Suppose kitty is slightly overweight, and you want to balance caloric intake with exercise to encourage some weight loss. In our Smart Pet Home, if kitty doesn’t get on the treadmill at least 30 minutes-a-day and walks a prescribed distance, then the food dispenser reduces the portions of food. Or kitty approaches the door-port to go outside, but it’s 10:00 PM and the door is locked for the night. It should signal the litter box to open and play a sound to alert kitty of a place to go to the bathroom. Or kitty has stomach problems; the litter box – after analyzing the deposits – should signal the food dispenser to change the mix of food types, or alert the vet. Or kitty is clawing at the blinds; Smart blinds should signal the mouse toy to activate and draw kitty’s attention away from the blinds. But because these devices don’t communicate real-world information to each other, this type of inter-functionality doesn’t exist. Most of the small Manufacturers focus on producing only one of these devices and there are no universal standards or language that can be used to exchange meaningful information between them. A few Manufacturers offer multiple devices and they interact using their built-in proprietary language and commands. That’s a small step forward, but it leads to a dead end, if you want to add devices made by someone else. Of course, the problem extends to devices beyond the Smart Pet Home. We only saw one demonstration from LG – known for their appliances and Home Entertainment products – that made a focused effort at building the integrated Smart Home. Some of their examples were overly simplistic, but it afforded a glimpse into where the Technology is headed. I’ll write about the LG demonstration in an upcoming article. In the meantime, kitty is going to require personal attention the old-fashioned way. Or you can drop all of this pretense and get a dog. If you would like more information about Smart devices and how to integrate them into your stress-free IT, please contact me or your Account Manager at TRINUS.